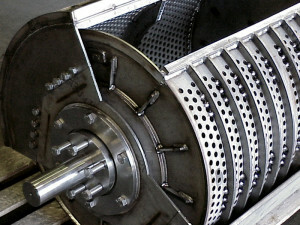 We are a recognized designer and fabricator of carbon steel and alloy process equipment. 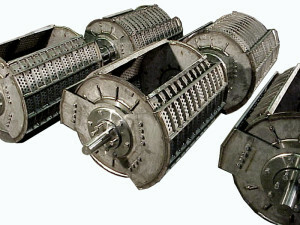 Shown here are stainless steel rotating (tumbling) barrels with rotating covers which, when installed in the process line are motorized and remotely controlled. Each barrel processes around 1,000 lb. of product per load. In use the barrels and their content are lowered into a variety of tanks for degreasing, washing etching phosphatizing and bonderizing of the barrel contents. We were originally contacted because our customer was not satisfied with the barrels furnished by a competitor. We were tasked to redesign the barrels which had distorted, preventing the covers from closing properly. Our engineering team’s redesign strengthened the shells and improved the cover construction. We have now produced two generations of the barrels, which are now lasting over 13 years instead of the original 5 to 6.